The Porter 700 incorporates the exacting high standards of Style, Design, Performance and Technology that Piaggio is known for internationally. It offers the best Mileage in its class. It has Superior Power (14.75 HP) & Torque (40 Nm), enabling superior pick up and acceleration. The payload capacity of 700 kgs and long cargo deck (30 sq. ft.) ensures superior load carrying capability. It also has Highest Ground Clearance (218 mm) in its category to negotiate bumpy ride easily. It offers superior grade ability(21%) & maneuverability which ensures driving on steep gradients including city flyovers and narrow city roads easier. 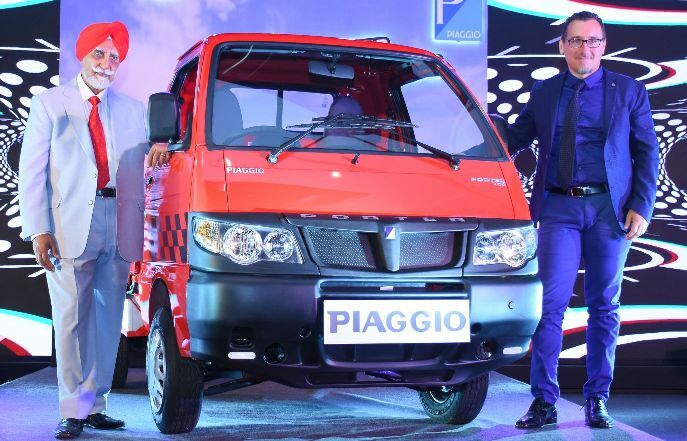 This new vehicle from the house of Piaggio, comes with Stylish Italian design, it is the only vehicle with twin headlamps that adds to its superior looks and enables safer night driving experience.The 5 speed floor mounted Synchromesh gear box ensures smooth & comfortable drive. Mr.Diego Graffi, the new CEO of Piaggio Vehicles Private Limited said , “Anticipating our New Age customer’s needs, Porter 700 has been conceived as a modern, stylish vehicle with many new features and yet delivering its core values of exceptional reliability, fuel efficiency and earn ability”, for Piaggio to continue its dominance in the last mile transportation cargo segment. Piaggio Vehicles Pvt. Ltd. is a 100% owned subsidiary of Piaggio Group. The Company commenced operations in India in 1999 with the launch of the 3 wheeler brand ape' which was an immediate success and has grown from strength to strength over the years. PVPL created the market, grew it , and has sustained a dominant and leadership position in the Diesel 3 wheeler segment. Piaggio is a leading player in the light transportation industry with a complete range of 3 and 4 wheelers in Diesel, Petrol, CNG, LPG fuel variants. The Company’s products are not only endorsed by over 2 million satisfied customers across India but also exported to more than 35 countries worldwide. Piaggio has a state-of-the-art manufacturing plant at Baramati in Maharashtra, [with an installed annual production capacity of over 300,000 three-wheelers and 80,000 four-wheelers]. It is also moving towards self-reliance with the completion of its advanced engines plant on the same campus. Piaggio has over 2500-strong work-force comprising experienced engineers, R&D specialists, plant workers, sales, service and marketing professionals.